The Alexa Rank is a method of evaluating a blog or site based on the traffic generated. It would be an excellent method of calculation, but it involves only the users that have installed the Alexa toolbar in their browsers. This peculiarity makes the evaluation not so accurate and rewards, for example, the technological blogs, which users and visitors are actually more inclined to install the Alexa Toolbar, in relation to readers of blogs in different niche, which in many cases ignore the existence of this tool. Advertisers and webmasters use it to help them determine (right or wrong, up to you decide) the worth of your site and how much pay you, for example, for sponsored posts. The popular network Text-Link-Ads (now MatomySEO) decide, based on Alexa Rank, what you will get paid for a link or content placed on your site. Also “Link Vehicle” is another site that uses this evaluation tool when they have to place your blog in their marketplace. If you want to monetize your blog with these or some other services that use actually the Alexa Rank, then you have to increase it. Increasing the traffic of your site will increase your Alexa Rank. The more you get valued from Alexa, the lower will be your rank (as opposed to the PageRank). Under 100.0000 of value, the measurement is more accurate and precise: of course, your goal is to get below this threshold and lower and lower! The first advice is to always write quality content and achieve a base of loyal readers. Here below you find a list of tips to follow in order to increase your rank. Download and install the Alexa Toolbar in your browser (if you have not already done it) and join the circuit of the Alexa sites. Install in your blog the Alexa widget. This widget will communicate with Alexa and count will be loaded every time you visit. Encourage your readers to use the Alexa toolbar. Remember the more readers will visit your blog with the Alexa Toolbar, the more your rank will improve. Like the one you’re reading. Write your own review on the top 100 rated Alexa sites and include your URL. Submit the best links and articles of your site to StumbleUpon or Reddit (users are quite inclined to love tech there). This will bring huge amount of traffic to your site and contributes to increase your Alexa rank. Write content related to webmasters, as most of them use the Alexa toolbar. So if you want them to visit your site and increase your Alexa ranking, then you may write useful articles related to SEO, Internet Marketing or webmaster tools. Finally share your posts on webmaster forums and social networking sites. Comment on blogs with high Alexa Rank. Placing a comment on higher ranked blogs should give you more traffic, plus you will build higher value links, improving your Alexa Rank accordingly. Increasing your blog traffic will automatically improve your Alexa rank. So if you produce quality content and promote your posts in the right way, then your Alexa rank will much probably increase. Do you pay attention to Alexa rank? Do you have any other suggestions related to this topic? Please share your views, thanks! Nice post on Alexa! Bloggers consider it as one of the important stats and it is directly related to blog traffic. I’m following all the tips which you’ve listed here and yes, blogging communities like Bizsugar & Kingged would help us to get good Alexa. I have seen good Alexa result while publishing in-depth posts too. Thanks for writing this helpful post for us, have a good day! Who does not want high rankings on our sites, right? Glad to hear you are already following all the tips mentioned in this post. Thanks for commenting and sharing the post, Nirmala. Have a fantastic rest of this week. Nice to see awesome post and guide to increase Alexa rank . actually alexa rank doesn’t matter much but after the Page and domain Authority , advertisers check alexa rank to analyse any website to adverise there . By the way my blog’s current alexa rank is below 40k but wants to increase more. Congratulations on having your site below 40k of Alexa, Siddharth! Just visited your site, looks good! Do you have any secrets to improve Alexa you want to share? Yes, I pay attention to Alexa rank because it’s important measure of each websites. Now I’m interested in alexa rank increasing with a special services, did you ever used any? Nope, I never used any paid service to increase any of my site rankings. Alexa ranking is one way of knowing the viability of a website. It sure reveals valuable traffic but one should not be deceived by the constant traffic inflow. The value of each traffic should be considered as well. However, its good to know of the eight ways detailed in this post! Installing the toolbar and widget helps in facilitating the traffic increase! I left the above in kingged.com where this post was shared. Alexa is just considered from advertisers. And yes, sometimes it it still used by bloggers to check at first glance the “level” of the blog. Glad to hear you enjoyed the tips mentioned in this post. Some really smart ways to increase your Alexa Rank. I have heard so much about it, and will definitely be checking out the possibilities with it.. Seems like a really good tool that can bring great results. Recently, I have been focusing a lot on writing better quality content – will see where that leads even though I must say that I am already seeing results in terms of my daily traffic. It is also good to connect and comment on blogs with high Alexa ranking. Very thoughtful of you to share this post. Thanks. 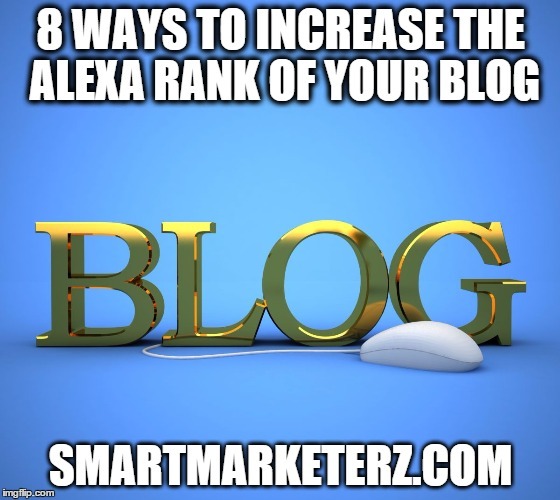 glad to hear you liked the tips included in this post to increase the Alexa ranking of your blog. Many bloggers/marketers desire to increase their blog rank in Alexa. Time flew fast and it became more essential to blogs since it crease a huge impact and built curiosity about certain blog if its rank is high. These are simple and practical ways to boost blog ranking. By simply installing the toolbar and putting widget on your website, your rank will perk up most especially if you will consistently create and publish high quality content. You can also submit your site in directories. It will help anyone to create popular inbound links. Great post to wrap it up. Thanks for sharing! because they want to earn more! Advertisers really still look into it to judge the “level” of a site. Oh yes, Alexa rank is very important! The blogging beginners need to know this! Good to hear you found the post useful, Saurabh. Great information you shared about Alexa ranking improvement……I completely agree with your points which really helpful to improve Alexa ranking of your website. These are Alexa toolbar installation, adding Alexa widget and writing blog about Alexa. By my experience if you drive more organic web traffic to your website it impacts positively on your Alexa rank too. So always try to add fresh and interesting content which drives more web traffic to your website. Thanks for sharing valuable guidelines to improve Alexa rank……..Have a great weekend……..!!! How is your blog Alexa ranking going? My blog SEOGDK achieve milestone of 50000 of Alexa rank currently. Before 2 years rank was more than 15 lacs. I enjoyed reading your actionable tips to improve Alexa Ranking. For me, the most notable were guestposting on high ranking sites and dragging quality traffic to your website. Any website owner who really wants to improve their Alexa Ranking must focus on what they can control. While it might not be easy to get your friends to install the Alexa widget on their sites and then link to yours, you can strive and get guest-posting opportunities in websites that rank better than yours. A lot of bloggers (especially new, unconnected bloggers) shrink at the idea of guestposting. This is because it is getting increasingly harder to get guestposting opportunities in top sites. However, the trick here is to start with smaller sites that still rank better than yours then as you build your reputation, you can start to pitch bigger sites. Wonderful post, Erik. Thanks for sharing. Welcome to my Smart Marketerz blog. You mentioned good ways to get more traffic and to improve the Alexa ranking of your site. Thanks for visiting, and have a great weekend! Nice Post. Alexa used to be a nightmare for bloggers. I think things have changed. Although, Alexa is important as far as reputation is concerned, but many experts don’t consider Alexa relevant to the success of the site. I don’t disagree on the importance of alexa rank because successful websites and blogs have better alexa ranks than unsuccessful websites and blogs. I’m happy you wrote this blog post on Alexa Ranking because ultimately we all want to improve our alexa ranks. Besides all this, some niche sites have alexa ranks between 500,000 to 1,000,000 but having a good conversion rate, in short making good money… and they don’t really care about their alexa ranks. It’s all about money, for many bloggers. And Alexa ranking still matters. Great article! I’ve installed the toolbar onto Firefox, but don’t want a widget on my site. I agree with Hassaan said in his comment. I know many sites that are doing well with a horrible Alexa score. So it is important, but it depends what metrics are important to you and your individual goals. Hi, Erik! Thank you for the article. May I add that there is one another way to improve your Alexa Rank? Alexa Surfing service allows you to do this by visiting the sites of other users for 40-70 second. You will receive the points that can be used to get the real visitors to your blog. It is very simple and legal. Thank you for such a good post. Meanwhile reading I switched to alexa to get alexa bar and alexa widget. Good to hear you learned something new from this post, Jeesham. I read your Article, You doing such a awesome job, but I have one question kindly tell me. I want to know forum posting and blog commenting which one is the best for improving Alexa rank. Alexa is still a biggest indicator especially by many advertisers so it is very needed to improve it and lower it down 100K to win most leads. Great and helpful article for the newly blogger. Great article ! Thanks for the info about alexa ranking. well it would not be wrong to say that alexa ranking factor became a lifeblood for site. On behalf of ranking factor in alexa’s algorithm for websites having products increases conversion ratio and for blogger, is a source to be famous and earn money. one is to update your blog with seo friendly content in regular frequency and second is to fetch direct traffic whether by social media,web 2 or backlinks. The main thing is how much traffic and popularity your blog is getting. Nice and useful information, I will start implementing on them so as to boost my Alexa rank. Great tips to learn. Although many bloggers don’t like Alexa rank but I am sure that everyone is following a good alexa rank website. Really great and very informative post for every blogger. The blog that having alexa rank under 100k attract more advertiser and help to make more money. I think two points will help to boost Alexa rankings one is to update your Blog with seo friendly content in regular frequency and second is to fetch direct traffic whether by smo site. Hii these tips are very helpful. I really liked it. Keep it up. Good job. My website alexa rank was 9,197,058 and right now 1,463,306 . Very informative article, thanks for the information and keep writing such amazing articles. My new site is only 1 1/2 months old and I am almost breaking the 2 Million mark. I got a long way to go. My takeaway from this article was installing the Alexa toolbar and utilizing Reddit and StumbleUpon. Thanks, thanks, thanks Erik. The alexa rank is really important and the tips you have provided are very helpful. I will use these tips to get a better rank for my blog. Thanks a lot, I am searching on Internet – how can I increase my site’s Alexa rank, finally found it here() with full guide. keep sharing. Hey brother thanks a lot, I try these tactics for my blog. Great article ! Thanks for the info about alexa ranking. well it would not be wrong to say that alexa ranking factor became a lifeblood for site. If wants to get good alexa rank ? Then just focus on fresh and unique content. Above mentioned steps really helpful for Newbies….BTW…Thanks for sharing this informative post….!! Hello, Nice tips to improve alexa rank. By appling some of the above mention tips I have improved my alexa rank. Thanks for sharing.